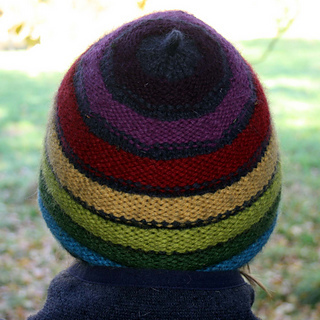 Alternating bands of stocking stitch and reverse stocking stitch form a horizontal rib which makes for a warm, snug and elastic hat. There are many similar patterns – both paid for and free but as far as I know this is the only pattern that uses only knit stitches – no purling necessary! Instructions are given for worsted/aran weight yarn but it is easy enough to modify for most yarns. 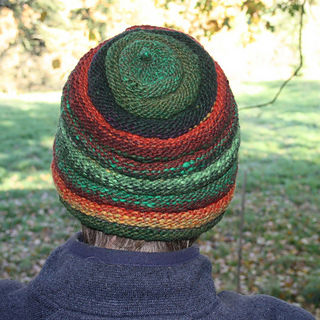 You could use the hat inside out for a slightly different look as the horizontal rib is 3/6 rows. Instructions are also given for an eyelet version. It looks equally good if knitted in a long colour change yarn like Noro Kureyon or in more than one colour of solid yarns. Instructions are also included for a version with eyelets. 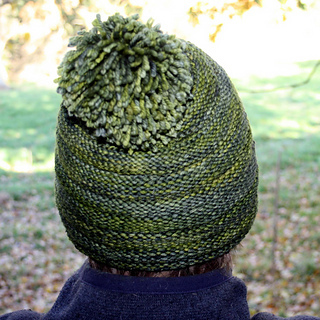 Quick and easy – knit it in one or two evenings. Ideal for last minute gift giving.